In December 2008, out of the 100 online retailers ranked by Internet Retailer as the “Hot 100 Retail Web Sites”, 75 had an affiliate program. 38% of the 75 top Internet retailers chose Commission Junction, 23% went with Google Affiliate Network, 18% with LinkShare, 13% run their programs on in-house-based platforms and the last 3% went through ShareASale. The EPC (Earnings Per Click) 7 days and 3 months averages as a Key Performance Indicator for affiliates and provided by affiliate networks such as Commission Junction. 1/ Expand reach – sell your products & services via a wide range of websites (PPC, SEO, Blogs & Forums, CashBack, Reward Program, Coupon, Email, etc). According to Commission Junction, merchants increased revenue from 15% to 40%. 2/ Brand exposure – raise perceptions of brand with exposure on quality 3rd party sites. 3/ Measurability & accountability – use of tracking tools combined with your web analytics & sales data to see the big picture and measure ROI. 4/ Reduce costs/financial risks – affiliates offer merchants a virtual sales force. The CPA (Cost Per Action) performance model is very cost effective in this respect. 5/ Inform Marketing Activities – learn from affiliates what is working in terms of pricing, offer, product, proposition and landing page. You can also check their efficient PPC ads. This Key Performance Indicator represents the earnings per one hundred clicks sent by affiliates to the merchant’s website. 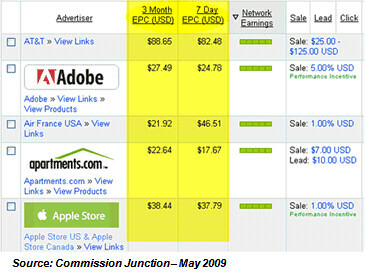 Most of affiliate networks provide merchants and affiliates with this EPC figure. For example, thanks to this KPI, we can see that with a 5% revenue sharing Adobe generated a payout of $27.49 as an average for every 100 clicks sent by the affiliate during the last 3 months. On the other side, Apple, offering only a 1% revenue sharing, was more interesting as it generated an earning of $38.44. No doubt about which brand an affiliate should promote? Keep this in mind. Which top publishers to consider before selecting your network? Forget the pareto’s rule (20:80) and the long tail theory. It is most likely that the leading 6 to 10 super-affiliates accounts for 80% of your sales. This is why you should offer them a wide creative inventory (banners & text links), run bonus campaigns (to reward highly productive affiliates) and give them personalized attention (specific landing page, exclusive coupons or anything else). According to the E-consultancy US Affiliate Census report, Paid search or pay-per-click advertising (PPC) is the most significant category for US affiliates (48%), marginally ahead of true content (SEO) on 46 % in terms of the amount of revenue they help to generate. Blogs and forums are an important category for 40% of affiliates. Social networking (24%), cashback & reward (23%), email marketing (20%) and coupon codes (19%) are the next most important methods. 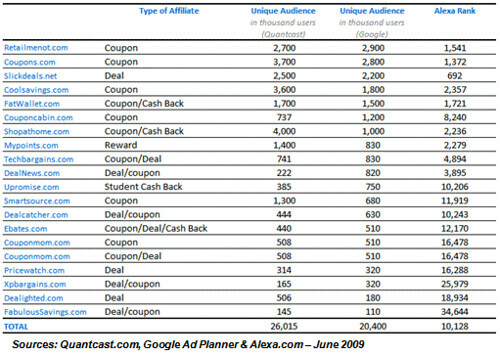 Top 20 affiliate publishers per audience and ranking that should be considered before to choose your network. Set-up/technical integration costs – The up-front cost of setting up an account with a network typically varies from $500 to $5,000. Transaction fee (over-ride charge) – The majority of networks charge a transaction fee from 20 to 30% for their services. This means that for every commission fee payable to an affiliate, the network must receive x% on top of this payment. Monthly Management charges – top networks generally impose management charges on their merchants between $50 to $1,000 a month. While choosing your network, please remember that multiple networks work for merchants and affiliates. From a pure administration perspective, despite the cost, dealing with one or several networks is far easier than dealing with a multitude of different affiliates. In Dec. 2008, out of the 100 online retailers ranked by Internet Retailer as the “Hot 100 Retail Web Sites”, 75 had an affiliate programs. 38% of the 75 top Internet retailers chose CJ, 23% went with Google Affiliate Network, 18% with LinkShare, 13% run their programs on in-house-based platforms and 3% market through ShareASale.